According to a new 36 pages report by Commerzbank, Central Asia and Mongolia are becoming increasingly important, not only as a vital supplier of natural resources, but also on account of their geographical location as a crossroads between Europe and Asia. Commerzbank forecasts that future economic growth in the Central Asian republics will be higher than the global average. 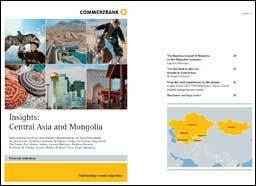 With this report, Commerzbank wants to show the diverse business opportunities in Central Asia and Mongolia, as well as the risks. They themselves have been present in the region for many years. They have representative offices in Turkmenistan, Uzbekistan and Kazakhstan, while also maintaining business relations with banks and other organisations. However, the projections in the Commerzbank report aren’t in line with forecasts made by the World Bank or EBRD. Economic activity in the Caucasus and Central Asia (CCA) region is weakening, mainly because of the near-term slowdown and rising regional tensions affecting Russia, a key trading partner and sources of remittance and investment inflows, as well as weaker domestic demand in a number of CCA countries. The differences between the countries in the region are substantial, however. The most important trading partner for Germany is currently Kazakhstan, which has profited from the energy boom of the past decade thanks to its extensive oil reserves. Measured in terms of the per capita gross domestic product (GDP) Kazakhstan has, as a result, virtually caught up with Russia, and is thus the richest nation in the region by far. The rapid rise of China and the associated increase in demand for raw materials saw an increase in prices, driving rapid growth in the country – which also has other resources in abundance. Kazakhstan is also clearly ahead of China, where GDP per capita is $7,000, placing the country on about the same level as Turkmenistan, which has major natural gas reserves and is expanding its processing capacities. The report, however, came out just a few days after Kazakhstan dropped its projected economic growth to 1.5%, its lowest rate since 2009, and announced that its projected industrial output would come at the lowest rate in nearly two decades. Likewise, Standard & Poor’s recently cut Kazakhstan’s credit outlook to the second-lowest investment grade, with a negative outlook alongside. Neighbouring Uzbekistan has a position among the top ten gold exporting nations and cotton producers. It has rich uranium deposits and energy reserves, as well as major development opportunities in the “silk road tourism” sector and a diversified manufacturing industry. Tajikistan and Kyrgyzstan have major water resources, says the report, which are also of significance to their neighbouring countries.